Regina Apostille Authentication Legalization Services – We Can Help! 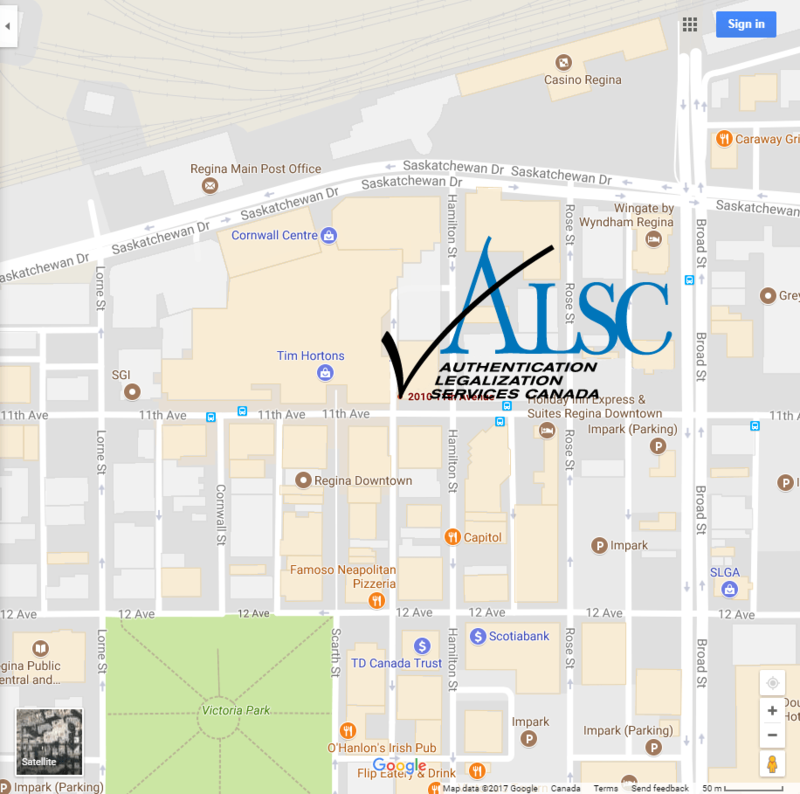 You Are Here:Home/ALSC Service Centers/Regina Apostille Authentication Legalization Services – We Can Help! Having a Saskatchewan document validated for use internationally can be frustrating let alone knowing whether it should follow the apostille or authentication and legalization process. As the Canadian experts for international document certification this is something that we hear often at Authentication Legalization Services Canada (ALSC). To help Saskatchewan individuals and corporations certify their Canadian documents for use internationally we have opened our convenient ALSC Regina Service Center. Whether it’s a Saskatchewan Birth Certificate, Marriage Certificate or Incorporation Certificate that maybe required while doing business in another country our experts have the answers for you. If you need to use a Saskatchewan issued document, or any Canadian document, outside of Canada it must be authenticated at Global Affairs Canada in Ottawa. Once authenticated it then must be legalized at the embassy consulate of the country you will be using it in. This process for validating documents for international use may also be called Apostille or Attestation by some countries. As noted her in Canada we use the authentication and legalization process to validate documents for use internationally. Before beginning the process its important to have the correct document as it could cause delays. You can find out more about a specific document and what is required for the authentication and legalization process see our Quick & Easy verification on our homepage. If you need to order a new document you can find the links to help below. 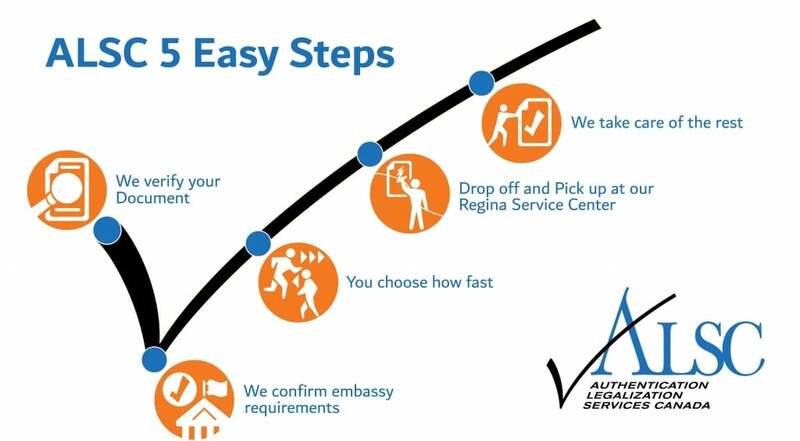 Once you have confirmed your service options we can then set up an appointment for you to drop off your documents and ALSC order forms at the Authentication Legalization Services Canada – Regina Service Center on the 7th Floor, 2010 – 11th Ave. Regina, Saskatchewan S4P 0J3 . They will be waiting for you at the Regina Service Center to ship the documents overnight to our national headquarters in Ottawa, where the documents will be processed. Now we do our part keeping you updated at every step via email. Upon completion of the process we let you know when you can pick up your completed documents at our Regina Service Center, it’s that simple. Best of all it’s guaranteed! Click below to get started with the Regina Apostille, Authentication and Legalization Specialists. By ALSC|2018-06-11T15:28:45+00:00April 22nd, 2017|ALSC Service Centers|Comments Off on Regina Apostille Authentication Legalization Services – We Can Help!